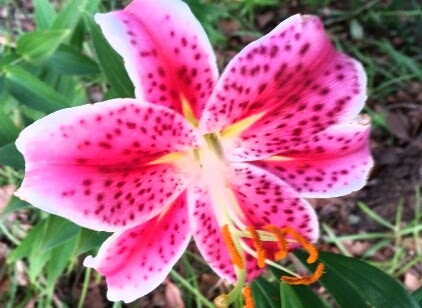 This is a very beautiful flower that grows under a tree in our back yard. They bloom out in many different colors. We have had white, red, orange, yellow, and then pink as the one displayed here. I've noticed something about these beauties of nature; they don't live very long lives. They stay closed up in pale green, shell-like buds for a few weeks before they bloom into something majestic and breath taking. Shortly after springing from their dull shelter, they start to whither and eventually fall right off the stem. Their beauty is here long enough for us to get a glimpse of their glory and then they are gone, vanished before having time to really be gazed upon. The life process of this pretty, little flower reminds me of a verse from Isaiah. "The grass may whither and the flower may fade, but the Word of God stands forever." You see friends, God reveals His power and glory to us in small fragments in which we can handle. The work of His hand can be found all around us. Unlike the glorious creativity in which He displays, He and His Word never perish. He is always here. He will never leave us or forsake us. He is the beginning and the end. So the next time you hear someone say, Where is God? Point out His existence among His creation, point them to the Word that never fails to keep delivering, and remind them that God is with us and He never fades away!